The Bahamas is a spectacular destination made up of over 1,000 islands. 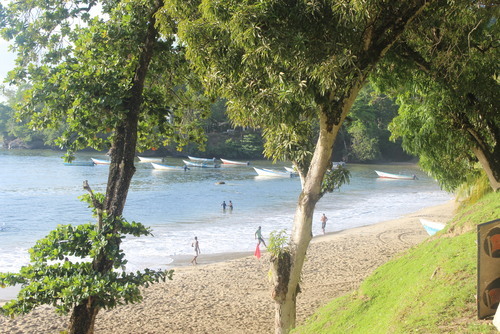 Expect friendly English speaking locals, spectacular beaches, a warm climate, luxury resorts and lots of things to do. If you would like to travel, take a gap year, work, teach, intern, volunteer or study in the Bahamas our directory will help you find a dream trip. Get essential travel information, ideas and inspiration if you would like to travel, take a gap year, go backpacking or work, intern, volunteer or study in the Bahamas. Visiting the Bahamas will be one of the best choices you can make, the experience is made easier by the fact local people speak English. We have some amazing small group activity holidays and unique travel packages which are perfect if you would like to do more than sunbathing. Flights: To get the best deals book off season or well in advance to secure the best deals. Accommodation: Although the Bahamas is a luxury destination there are still mid-range and cheaper hotels available. The Bahamas is a very safe destination and you shouldn't have any problems with local people, they are very used to seeing tourists and will be very friendly especially when they learn you are there to help. You might want to visit your local healthcare facility prior to departure to check any recommended vaccinations and also pack light clothing and lots of sunscreen - the sun is incredibly hot in this region of the world. If you are looking for a warm and exotic destination to volunteer in Central America you can help in the beautiful Bahamas. There are inspiring volunteer projects where you can help communities, wildlife, marine conservation and the environment. 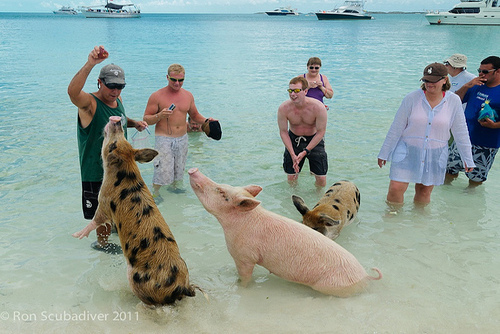 The Bahamas is a luxury destination but by working you will get to be more than just a tourist escaping the resorts and see a different side to the country interacting with local peoples. You will find large international organisations and also local NGO's and non profits offering projects to internationals where you can help community development and conservation efforts. This country is very small but there are some of the most stunning scenery and beaches in the world, spend more than just your average holiday doing something genuinely benefical. The hard part will be having to leave! 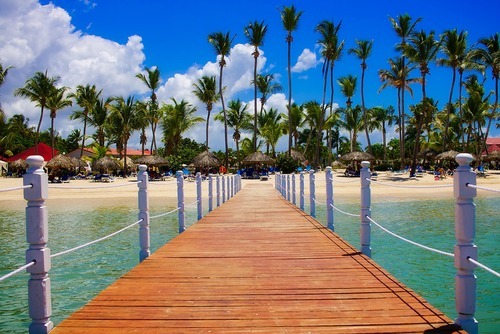 Projects are located in the capital - Nassau and also remote coast areas. If you join wildlife conservation programs you might be working in Great Abaco and San Salvador Islands which are spectacular. You might also like to view our Cuba volunteer programs. The Bahamas has a population of around 350,000 people and around 10% of people live below the poverty line. Most of the country is very developed but in rural areas there is need for assistance improving infrastructure and facilities. NGO's organise group programs where you can help with building new structures like community centres, improve housing or do general tasks like paining and decorating. There are also land based projects where you can work in a local school educating youngsters whilst also getting to live in a tropical paradise learning more about the culture and tradition of the country. 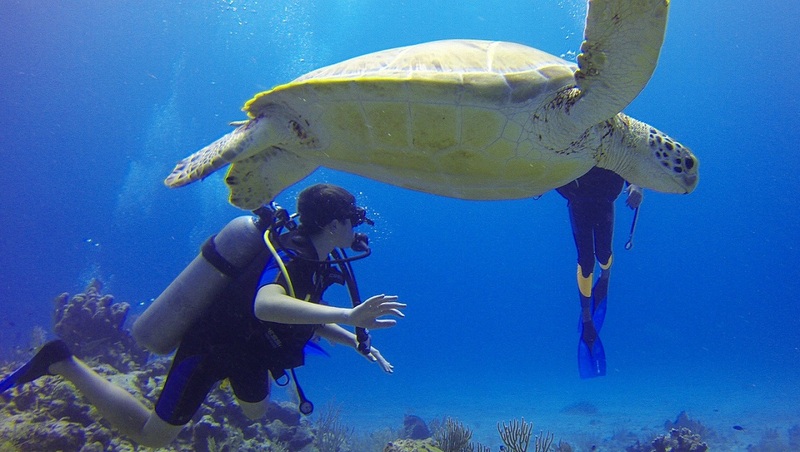 There are lots of land based and marine conservation programs you can join in the Bahamas, some are skilled positions but most are open to all people. 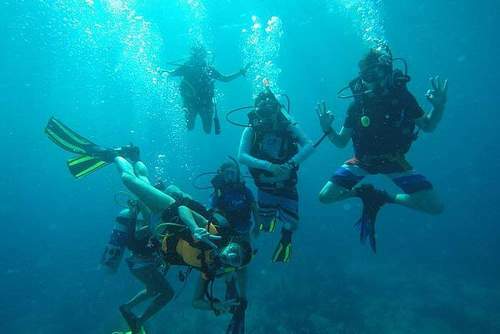 Marine based programs are very popular where you will get to go swimming, snorkeling, scuba diving to monitor coral reefs and wildlife. Some projects include helping the local Bahamas National Trust creating protected areas and keeping this destination as intact as possible. Working with whales and dolphins can be really worthwhile, you can help protect these amazing animals whilst creating a safe environment for them to live. Tasks can include helping local scientists collecting data, monitoring/surveying, tracking and creating cleaning oceans through beach clean ups and rubbish collection. There are also coral reef restoration programs where you will get to swim in clear waters monitoring the ocean and finding ways to better preserve coral and marinelife going forward. Programs usually come part of a package which include placements, training, in-country support, support, meals, insurance, accommodation, transfers and also onsite equipment, excursions and permits. The price can depend on the project and also the the time you would like to join for, generally prices start from around £250 ($500) for 2 weeks but longer term programs can also be joined. You will need to pay for flights. The Bahamas is one of the most beautiful locations in the whole of the Caribbean, this is definitely a luxury voluntourism destination and prices are higher here but you will get more value in nearby countries. It can be difficult to volunteer for free or even find paid positions unless you are actually leading groups. If you are looking to experience this country on a budget try to avoid expensive restaurants in the hot spot touristy areas. Most volunteering projects can be joined for 1-2 weeks but there are also longer term placements available depending on how much time you have spare. The Bahamas is one of the best places to work in the Caribbean with welcoming local people, a friendly atmosphere and sun almost all year round. Possibly you have been here on vacation or you have always dreamed of visiting, well why not stay a little longer by applying to work, teach, intern or study here. Some companies offer work experience / internships in the Bahamas for students which can be a good way to get on the career ladder. There are teaching jobs in the Bahamas for internationals. 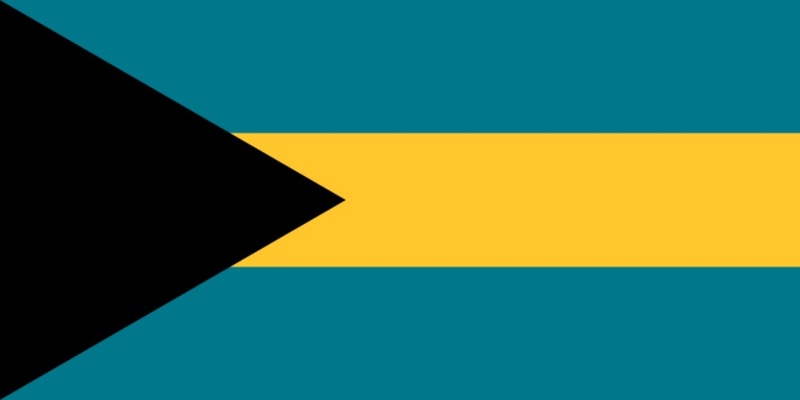 If you are applying from overseas you will need an official visa to work in the Bahamas. There are lots of international and also some local companies which employ foreigners and they will be able to help with your application and visa issues. We get a lot of enquires from people seeking summer jobs for students in the Bahamas but getting part time and short term positions is difficult. Although it is not the easiest destination to get a visa, it isn't impossible and there are various positions with local and international companies who offer proffesional full time, part time and flexible positions. The hard part will be not staying forever. There are lots of trips, tours and adventure travel packages available to book all year round. 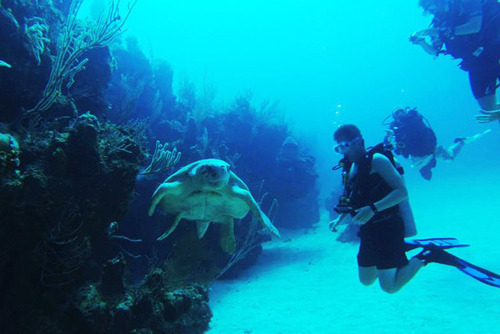 The Bahamas is a unique destination to go scuba diving, there are over 700 islands many of which deserted and in the surrounding waters. 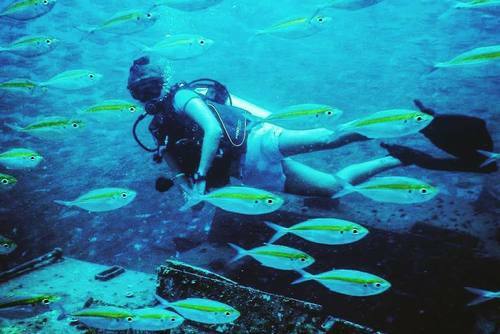 This country is a popular destination to book a beginners package or more advanced dive course partly due to the crystal clear waters and amount of marine animals. The Bahamas is a very popular destination to learn to dive, there are lots of great value packages available to book all year round. There is no best time of the year to go diving here, the Bahamas has a tropical climate with over sunny weather almost all year round. There are beginners dive courses, cheap dive packages, liveaboard excursions and options for more advanced divers. 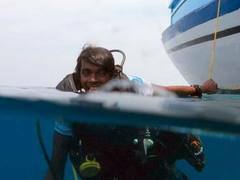 You could also apply to become a scuba diving instructor as several local resorts offer diving jobs to foreigners in the Bahamas. 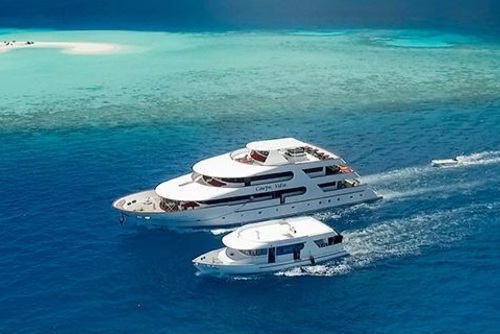 You can see colourful coral, wrecks and plenty of marine life including hammerhead and reef sharks, turtles, wahoo, grouper, jacks, eagle rays and mahi mahi. 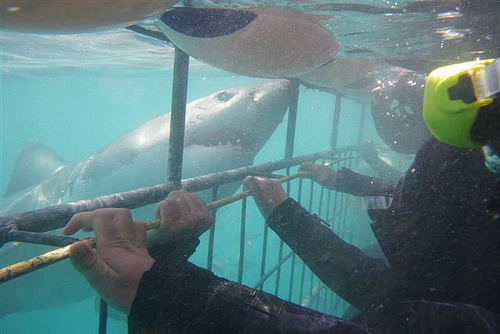 The Bahamas is one of the few destinations in the world where you can go diving with sharks outside a cage. 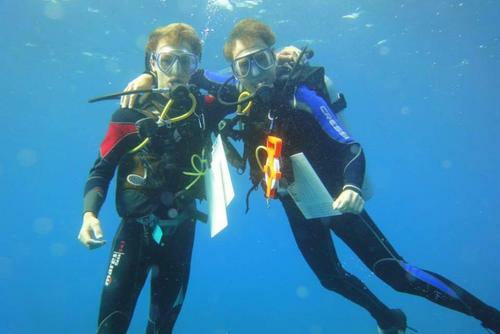 If you are brave enough and are seeking this adventure several local dive operators offer such trips. You might also like to search our rewarding volunteer opportunities in the Bahamas where you can help sharks and other marine species. 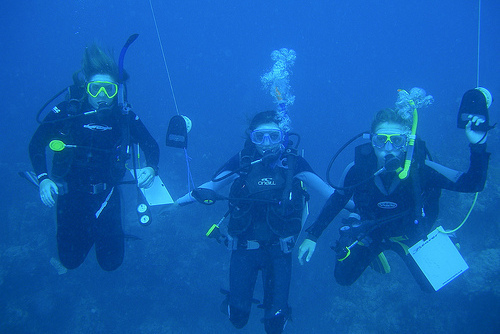 To get a dive job in the Bahamas you will need to contact local operators and check latest vacancies. 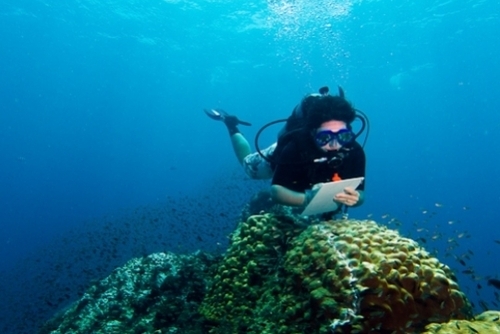 You could also train to become a PADI divemaster here and then seek dive employment anywhere in the world. If you need any help arranging a trip to travel, work or volunteer in the Bahamas please get in touch.